Anxiety disorder and depression can be a never-ending battle for some individuals. People suffering from anxiety or depression may have a difficult time with everyday life. Work, school, and even simple things like going to the grocery store can be a struggle. For some people, trying to leave their house can be a challenge. According to the National Institute of Mental Health, anxiety disorder is the most common mental illness in the United States. It’s been estimated that 40 million Americans currently suffer from anxiety disorder. Having anxiety is perfectly normal; however, some people have constant, irrational thoughts and fears about everyday life. These people continually think about all the possible outcomes of any given situation, specifically focusing on the most negative things that could happen. The Anxiety and Depression Association of America has stated that “regular participation in aerobic exercise has been shown to decrease overall levels of tension, elevate and stabilize mood, improve sleep and improve self-esteem.” All of these benefits are because of chemicals in the brain called endorphins. Endorphins are released during exercise and give a “feel good” sensation, also known as runner’s high. Federal guidelines suggest that individuals should participate in two hours of aerobic exercise every week. Guidelines and recommendations can be found on www.health.com. Examples of activities include walking, jogging, swimming, and biking. Group exercise classes are a great way to workout, while at the same time socializing with others. 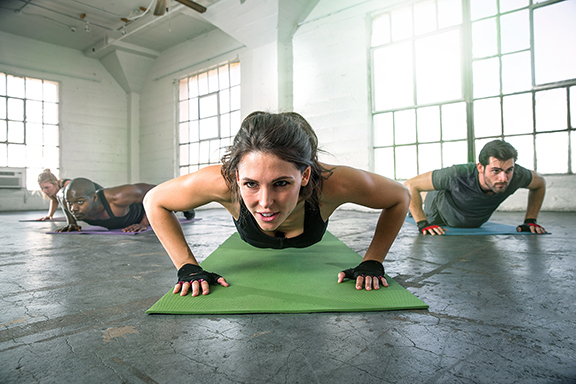 For those seeking guidance or support during a workout, group exercise classes can help. However, some individuals have social anxieties which make them feel uncomfortable around others. Individual workouts are just as effective as group workouts. When working out around others, people with social anxiety can try wearing headphones in order to distract them from their surroundings. Strength training is another great way to release those endorphins and gain a feeling similar to runner’s high. It is recommended by the American Council of Sports Medicine that an individual should engage in resistive training at least twice a week. You should perform 8 to 10 different exercises and perform 8 to 10 repetitions. Make sure that you don’t train the same muscle group on consecutive days to ensure that your muscles can fully recover before working them out again. To stick with an exercise program, it’s important to find an activity that you enjoy. The more you enjoy an activity, the more you will want to exercise, therefore leading to much greater benefits. If you are consistent with an exercise program, the more endorphins your body will release, therefore leading to a much healthier and happier you.